Important information on communications during a pandemic. Just google it. :) You can get one for about $20 USD. CB radios are a great way to communicate when everything else fails. A standard CB signal only travels about 4-8 miles, but mods can be made. A friend of mine, who turned me on to this site, has done some research regarding converting base stations. He found ways to enhance the signal across multiple states. It's not cheap ($500-$700), but it might be a great way to continue this forum. I, or my friend, will post more detailed info soon for anyone interested. Find a local Ham radio operator as they can communicate worldwide. I used to be one but let my license lapse . A short wave HF receiver would be enough to keep yourself informed. I'm certainly not advocating getting in the way of real Hams, just if you have one in the neighborhood, they can keep you updated on what's happening worldwide. Heh. It's been along time since I took the test (1977) - the FCC does'nt even have me on record anymore. I talked to a Ham friend of mine and said they do lapse. Anyway - after long discussion with said Ham, I've concluded that 2-meter is probably the best way to go for what I'm seeking. He and most of his Ham friends also maintain 2-meter set-ups. We live an a suburban system with a heavy 2 meter infrastructure that has a lot of generator backup. What I'm seeking is not so much the "big news" worldwide - I think I'll get enough of that sensationalist stuff. I want news from all the towns and stuff within a 30 - 50 mile radius. The stuff like, "If I leave my house to go to town, what's happening out there?" Also, for myself and few likeminded friends, we'd like to simplex and not use the repeater system to communicate with each other. The cost and technology is right - for $400 we can get up and running with a maybe 50 mile radius and airwave connection to many Hams. The Downside: we can listen, but if we transmit, we're breaking the law until we get our Techniciains licenses, though I doubt we'd be hunted down unless we made nuisances of ourselves somehow. The Upside: we can install, study ( my guides on the way and I already know Morse, which isn't even required any more for a Technicians), and if there's time, take the test at a local Repeater club. If we run out of time, we still have a communication system. Anyway - that's the current game plan! SAT INTERNET system with phone software! Sats will be the last to go down! I got a nice radio (Freeplay Summit) - they are available from many places on the internet but I got mine from 21stCenturyproducts. I paid about $60-$70 for it. I like it because it has a crank generator and a solar panel - plus a normal 110 volt wall charger. The batteries are NiMh - which are nice and have no charge memory. It is also entirely digital with a scan feature. Many of the cheaper crank radios only have analog tuning - and I think this would be difficult to use. In the Freeplay, once you have zoned in on the signal you can store it in memory and easily get back to it when you need to. It plays am/fm and shortwave bands. I think the shortwave feature will be useful if the local radio stations run out of power and stop broadcasting. For local communication in the immediate neighborhood I have GMRS/FRS radios. They use AAA batteries - and I have a solar charger for those. The range is only about a mile, though - even though the advertised range is 10 miles! sending enforcement units could alert you to the proximity of trouble. of raw information unfiltered by mass media. in the under US$100 range. The VHF radio in my boat travels a long way and can talk to Coast Guard and some police too. Gets weather and can talk to other people. It's parked in my driveway. So it is handy. Under $250.00 for complete set up. Doesn't have to be in a boat either. Hi Enumclaw, I am intrested in the VFH radio, I would love to be able to talk to other people during any crisis. Is this complicated to set up and operate? In your opinion where would be the best place to set one up. Does it have to be outside or could I put it in the house? You can tell I don't know much about this system. Do you talk to strangers or do you have friends that have one too? Could I ask you to post the information??? Pretty please!!!! I think it would be something to consider, but I readily admit, I'm clueless. I think I will also scrounge the bookstore for a good For Dummies type of book. $500.00 is doable, I didn't realize it could be done so reasonably. The one in my boat runs on 12V. Solar panels to recharge batteries. Yes it could be set up Inside the house. nNot hard to set up either. You would need 12V power supply. Antenae would have to be outside is all. You could talk to friends if they are close enough. Otherwise strangers. But you could see how other people are coping.Check out boaterworld online. Then you would be able to see prices. Spoon and I are 14 miles apart and we can talk loud and clear at 5 watts. 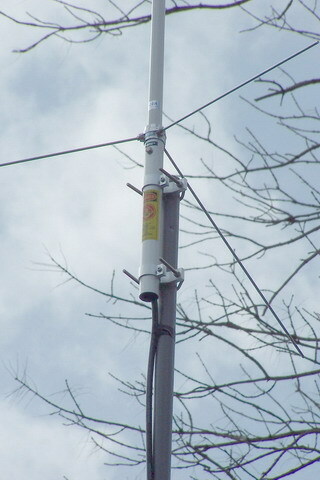 It can transmit up to 75 wattts. The radio has at least 3 national weather channels and also receives in the 150-159 range where most police and emergency services are, so it is also good to 'monitor the pulse' of the community. 2 meter radios also make alot of use of "repeaters", which though you need a license to transmit on, you can monitor easily. That allows people from further away than your radios range to communicate with you and you with them. Since it is mostly a "local" type radio, your reception and transmit without the reapeater appears, by all accounts, to be up to 75 miles. (!!!) Besides being able to talk to Spoon, we want to be able to hear what's happening 5 - 10 miles away - I'm sure the News will tell us what's happening in the cities...or at least as much as we need to know. 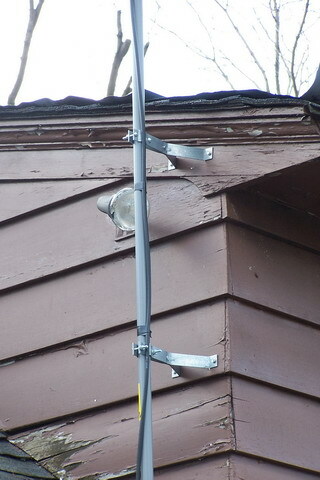 You will need a 5 ft or 10 ft mast from Radio Shack, as well as a 4, 6 or 8 inch mounting bracket for the mast. Assembly is very easy, as is mounting, Spoon and I each had ours up in about an hour. His was a little harder because of the hieght of his chimney. 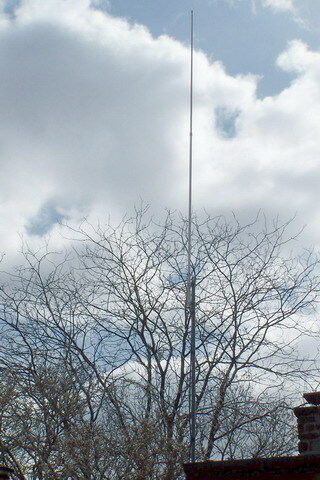 I needed a 10ft mast, but I could stand to mount mine. He could probably upload more pictures of the radio, etc. 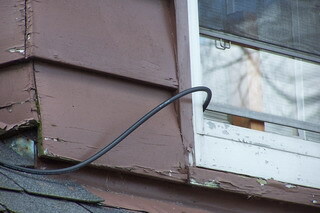 I'll attach one of my antenna. There is a book "Now You're Talkin!". I got it via the arrl's website http://www.arrl.org/catalog/lm/ (sorry, Spoon - I had thought Amazon, but now that you made me look up all the other data - I found it here.) Amazon has it and truthfully, you'll probably get it faster from them. According to them it takes about 2 weeks to get listed by the FCC on their web page after you take the exam and that's when you're legal to transmit. It'd be nice, prior to the SHTF to do so, and during also. The book also talks a lot about 'simplex' communication (person to person) and 'duplex' (repeater) operation. The ARRL home page off that link has a ton of radio info. http://www.artscipub.com/repeaters/, but we won't/can't really get on them until after being licensed...to do so both before or during SHTF would probably actually get those guys out and about to find us - (believe it our not, that's a ham thing anyway - contests to find transmitters dumped off someplace and whoever finds it wins). So, I don't really want to be "on the radar" until legal, though I don't think talking simplex with Spoon would cause any problems if we stayed out of the way and didn't jam up any repeaters...so it will be good to know where the repeaters are in your area, so you don't step on them. Also, check around for local "repeater" clubs as they are known....they will be the folks we'll be getting our news from and are emergency minded folks...chances are, if there is anybody in your community that might be liked minded it'd be them. Of course.....I will still be sort of shuffling and very non-committal in my personal conversation. I don't know how well these pictures will come out...ah...I see...cool.. Thanks for the infor Spoon. I am very intrested in this set up . Please post it. How do i go about getting a license? Who should I contact? What are the chances of a strong wind blowing this systen down. I guess you just put it back up right. Thanks guys. Just look one post up, Momma. That's the setup that I scored for Spoon and I.
I wonder how people will know when it is safe to go out if there is no telephone service or electricity? I live out in the country and I don't have any close neighbors.